W. H. Auden’s “Musée des Beaux Arts” is a free-verse poem that makes an idiosyncratic observation about art history. If that doesn’t sound like a promising idea for a great poem, it’s perhaps symptomatic of what we’re learning this semester: there are no great poetic ideas per se, but there’s the possibility of great poetry in any idea followed with enough verbal inventiveness and energy. I don’t know the precise pictures referred to in the early lines of Auden’s poem. But the device he’s talking about is familiar from many paintings of the European Renaissance. A momentous event from sacred history or secular mythology is presented, and in the background people are doing something awfully ordinary. Take, for instance, Carpaccio’s “Birth of the Virgin,” where Mary, Mother of God, has just been born to St. Anne. You’d think everyone would stop in their tracks and think upon holy things, but Anne, propped up in bed, needs some hospital food, servants in the background are seeing to the laundry and other postpartum needs, two critters that look like rabbits are eating some scraps on the floor, and Our Lady herself is fixing to get her first bath. The birth of the Virgin is a happy scene, where such laid-back behavior is at least in character. But details in horrendous scenes from Renaissance art can share this same oddness. In Fernando Gallego’s “Martyrdom of St. Catherine,” the saint is about to be put to death by a method too horrible to be contemplated. But in the foreground, the artist has painted a little dog. He doesn’t look too upset by the proceedings. Why the dog? Auden has his theory, of course: that such mundane details add to, instead of detract from, the sacredness of the events being depicted. The meaning of any beautiful created thing is, at least, as much in the soul of him who looks at it, as it was in his soul who wrought it. This poem makes me think about my own life. I sometimes feel so overwhelmed with the mundane yet important tasks that I must accomplish before the end of the day that I don’t see what is happening around me. I think this is true for alot of people. I often feel this way when an important event has occured. When Michael Jackson died I was at work doing the same thing I did the day before. It wasn’t until I got in my car and turned on the radio that I heard about his passing. It stunned me to think that while I was at work worried that I wouldn’t finish my work on time the “King of Pop” was dead. It made me quite sad that I wasn’t aware of it the moment it happened. I felt that I should have stopped and taken stock of the event that was occurring because it was an important part of entertainment history. The thing is that life goes on regardless of whether or not people take notice. If I had know about Michael Jacksons passing the moment it happened I wouldn’t have been able to change anything. I can understand how the ship seeing the boy with the wings fall out of the sky can just sail by. This poem was seemingly simple but, as mentioned we have learned so far this semester that nothing is simple or ordinary. It is very interesting how the author paints very random images to illustrate the meaning behind the poem; the children who are ice skating who do not want it to happen, the picture of torture with the tiny, innocent dog, and Breughel’s Icarus. I also wonder why in these terrible images of torture, and death do the painters insist on including images of innocence, and carelessness. Although the specific story of Breughel seems somewhat serious and terrible, it also seems to have a sort of humor to it; A guy who made wings out of wax and actually thought he could fly somewhere with them? That is humorous. But, at the same time the terrible aspect of the story is that you have this poor guy who is drowning and no one cares. To me, this seems as though it could be a metaphor for things that happen in life; either to one person something is extremely terrible while everyone else doesn’t care, or maybe that people in general turn their heads away when they see something bad happening because maybe they think that it will go away. This poem too was hard to follow. It did not really make much sense to me. I think it is talking about how we need to slow down and life and not be in such a hurry and eager to get to the big things we want in life. I the end it may not be what we expected it to be. That is really the only meaning that I could interpret from this poem. This is one of my least favorite poems on the countdown. When I initially read this poem without thinking about the title, I never thought that it was about art . My thoughts turned to how it is that people experience different feelings in their lives; suffering, expectation and happiness to name a few and how those feelings although very prevalent in the life of the individual feeling it, means nothing to the rest of us. The first part of the poem is heavily geared towards that end in my opinion. The poet says that suffering has a human position but it takes place while someone else is eating or opening a window or … Secondly, he tells of how it is that people anxiously await the birth of a newborn, while younger children could care less and only want to play. Finally, in the first part of the poem, he speaks of how the martyrdom must run its course in the midst everything else that continues to happen. The second part of the poem is what made me return to the title to see what the poem was truly about. The author suddenly changes courses on me. He starts with “Anyhow”. Wow, what happened. It then dawned on me that he was explaining a portrait or some type of picture. The thing that got me is that I liked where he was going during the first part of the poem, but I don’t like where he ended up. I guess it could be because I had lifted the bottle to drink my Pepsi, but when it hit my taste buds, Coke came out and that’s never good. This sudden change, made the rest of the poem useless to me and I instantly lost interest in it. What I got from the first three lines of the poem is that suffering is a part of human life. That it is inevitably going to happen and that life will go on. People will continue with their daily tasks regardless of the suffering of others. At least that is what is portrayed in the paintings Auden describes. After discussing this poem in class I thought of the Lucy poems and how a person’s death causes only a small ripple and really affects no one. The pictures described portray that. Especially the painting of Icarus, When I first looked at the picture I was expecting to find Icarus somewhere off in the distance, but when Morris pointed him out I did not expect him to be so close to shore. I felt that way because the people in the picture were going on with their lives and I figured they surely must have seen him fall in the water. This poem makes me think about 2 situations. One is that maybe we pay too much attention to things that really don’t matter much, and that we should realize our life will go on, that it is not the end of the world. And on the other hand, a situation I am leaning more towards and I feel is the point Auden was trying to make, is that we don’t pay enough attention to our surroundings. That we don’t realize the things that go on around us have an effect on our lives, and vice versa. This poem is one of my favorites so far on the countdown; it captures your attention very well, and yet does not keep so firm a hold on your attention that you aren’t able to let your mind drift to think about meaning while reading it. “Musée des Beaux Arts” is a great example of poetry that requires a little prior knowledge to fully understand the meaning behind the poem. The general meaning behind the poem is easily understood if one does not know the inspiration behind it, however the overall perception of the poem’s beauty is increased if one sees the paintings that inspired the poetry. The poet incorporates the two artistic mediums to evoke the reader’s attention to the human condition and shifts to the concept of useless martyrdom. This combination of poetry and paintings creates a great tale of suffering and affliction that humans both create and feel as they sail through life. In the painting of “Landscape with the Fall of Icarus” it is curious to note that in the tale of Icarus and his father that Icarus flew too close to the sun while escaping their prison, and yet the sun is setting in the painting. Perhaps he had a long time to fall, so long that the sun had time to set while he plummeted to his death… Most of the paintings contained miniscule discrepancies that caused me to question their significance in the overall connotation of the poem. Most of the paintings dealt with suffering, disaster, human emotion and pain from the result of human actions. It is strange to me that one can see within the poem and paintings many different faculties of human passions embodied within the mundane details that seem so out of place, and yet give so much to the meaning to the arts. i loved the poem. it reminded me of a philosophical idea that essentially says, nothing is significant as it is happening. meaning, that the action itself is not significant in its own right. but it is our perception and relating to the event that gives it significance. for instance, the birth of marry. if you take the event only at face value ( a baby being born) it becomes just another run of the mill occurance. but you add to it that the baby is the mother of christ it becomes vastly more important. before chirst became “christ” the birth of his mother was just the birth of another lady. i like how this poem has brouht up this subject without ever actually saying it. it kinda leaves little bits and peices implanted in your mind for you to think about. There are a couple of ideas that I took away from this poem, one that suffering is part of all our lives. It’s impossible to go through this life and not experience pain and loss; it’s simply part of humanity. The thing I things I believe Auden meant for us to pull away from this was to show our capability of indifference to suffering. We ignore the suffering all the time, and while there is always an effort to bring these people into the light and help them by the large they are ignored. Many atrocities occur every day and we simply go on with our daily lives, going to school and writing blog posts for class. I think this is also what the artists in the three paintings also tried to convey in a way, something when Auden stated the “Old Masters; how well, they understood” showing that even with the suffering, the moment of pain for one or some people there are many more that go on with their daily lives. Daedalus, after finally escaping imprisonment with his sun had to watch him fall to his death and drown in the sea, yet the farmer still plowed and the ship sailed on. It really is the contrast from everyday life that makes suffering so significant to us, and that’s what the artists and Auden try to convey. This is definitely one of my favorite poems that we have read so far in this semester. After I read it, I associated it to the pictures we viewed in class and then it became even more remarkable to me. I like the connection that the poet makes to his audience by writing about the “human position”, and how it is understood. Suffering may take place somewhere around us and we might not even notice. A significantly tragic or blissful event may occur somewhere while other people don’t notice it at all, as if it is not important. The birth of the Virgin, the saint being put to death, and the fall of Icarus all seem to have great significance in history. However, in the paintings we viewed in class, there seems to be some kind of happiness and ordinariness portrayed by the artists. The servants going on with their regular tasks, the happy little dog running around as the saint is about to be put to a horrible death, the fisherman just going about his fishing business as Icarus falls out of the sky…all are events that would certainly catch my attention and I’m sure of many others. But for some reason this is not the case in the paintings. This reminds me of a poem we read earlier in the semester that talks about the death of a young woman and how her death is insignificant to the world, but makes a difference to one specific person. …”she lived unknown, and few could know when Lucy ceased to be;”… Maybe we only do see those things that we want to see and leave the rest somewhere in the shadows. And while we wish that the things that are important to us were important to everyone else, we just don’t live in a perfect little world. This poem and then also looking at the pictures that were presented with the poem makes me laugh. I never once looked at a piece of work and thought “About suffering they were never wrong”. But after reading this poem and looking at the art in a different way I can say he is exactly right. I felt like listening to this poem gave me another look on the art of the Masters. I think that Auden had it right when he was looking at these old paintings and thinking of the suffering that was depicted in the beauty of the oils. I believe art is an expression and the beauty of words can be the same as the beauty of the paint. The other thing is when you look into the meaning the beauty can deceive you into only think and looking at the beauty not at the suffering and sadness that is actually being depicted. “Musee Des Beaux Arts” By W.H. Auden is a very interesting poem. It seems to come off as a simple, but its depth is what is surprising. To me, this work was somewhat humorous. It almost seems like the theme is based around suffering, but it’s almost in a funny way. The ending to this poem seems to point out that even though people hold such importance to things or events, its more about how we perceive it. And In the end, how we perceive things is what writes out how everyone else in the future interprets it. Overall, this poem was very beautifully written and enjoyable. I loved the integration of art and poetry that came from this poem. A lot of times it is hard to understand exactly what the speaker is talking about or the poet is trying to convey, especially when it refers to some other art. I liked being able to see exactly what the poem was mentioning by looking at photos. It probably stems from the fact that I am a visual learner, so it was nice to have a little change of pace. As for the subject of the poem itself, I thought it to be really refreshing to see a poem which makes many references to art. Usually, forms of art all ignore each other, but when you really get down to it, they all actually are influenced by one other. It was nice to see that this poem recognizes the deep thought and energy put into creating art and even used it as inspiration for their own piece. The paintings this poem references all talk of people going on in their daily lives, unaware or unconcerned of the fate of others, although it does not really address how the speaker feels about this, only that it is how the world is. Almost a poem in a poem, I think this was wonderfully written because it makes you think not only about what it is saying, but the pieces it is talking about and the inspiration behind it’s existence. Every artist has an intended meaning to their art work. I could research all three of these described in the poem and tell you all what they are about or why the artist painted them. But after reading the poem and looking at the pictures in class it is pretty clear what the artist was intending to reveal. In every one of the paintings, something unusual is happening. However, you see people going on about their days as if nothing had happened at all. In “Birth of the Virgin” very few people seem to be affected by the birth. The woman holding Mary isn’t even looking at her even though she is holding her. 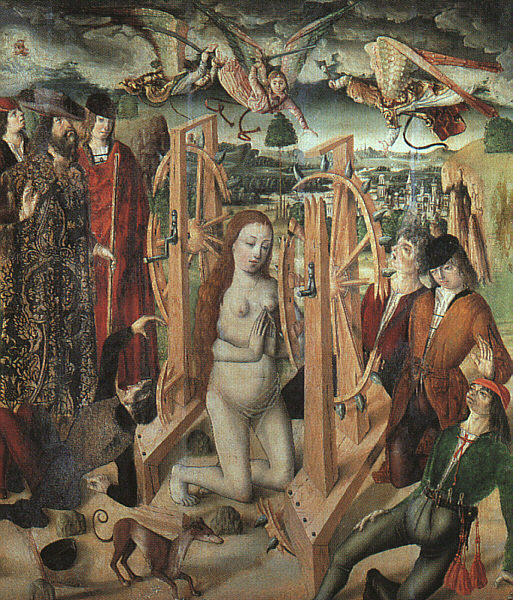 In “Martyrdom of St. Catherine” the dog in the foreground seems to be striding along completely unaffected by what is about to happen. In “Landscape with the Fall of Icarus” the boat seems to keep passing along as Icarus hits the water and the only person that seems to have noticed is the man in the bottom right wearing white, and it looks as though his attention is not even focused on Icarus. Everywhere around us something is happening or someone is suffering and we do not seem to be affected by the fact. Very rarely are we upset by something like this unless, like mentioned above, the person suffering is important to us or the situation will impact us negatively. Therefore, I think each of these artists painted these works to show us that life goes on and the poem does a great job, maybe better than the paintings in revealing the same fact. In the poem, Musee des Beaux arts the speaker describes a miraculous birth. It later at the end of the poem mentions the tragic death that took place. This poem appears to have a theme of human suffering throughout the text. The speaker shows the apathy in which humans may view an individuals suffering. Have heard the splash, the forsaken cry, But for him it was not an important failure, in these lines i feel so much honesty in the speaker. It shows reality and speaks blunt truth to the reader.